Calgary, Alta. 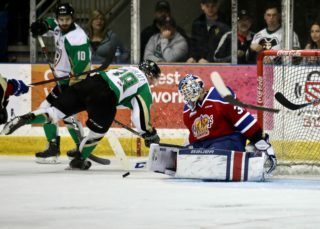 – The Western Hockey League announced today that Prince Albert Raiders goaltender Ian Scott has been named the WHL Vaughn Goaltender of the Month for September and October 2018. Scott, who was selected in the fourth round, 110th overall, by the Toronto Maple Leafs at the 2017 NHL Draft, posted an incredible 13-1-0-0 record, maintained a 1.57 goals-against-average, stopped 363 of 385 shots sent his way for a 0.943 save percentage and recorded two shutouts as the Raiders ascended to the top spot in the WHL. Twice, Scott was named the WHL Eli Wilson Goaltending Goaltender of the Week. He was twice recognized as the first star of the game, twice as the second star of the game and once as the third star of the game. 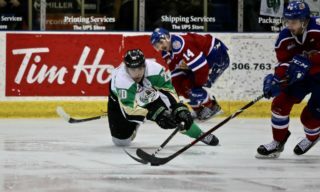 He was also recognized as the WHL’s first star of the night once and the third star of the night once as well. The 6-foot-3, 183-pound product of Calgary, Alta. won his first six starts of the season. After suffering his first defeat of the season in early October, Scott has responded with seven-straight victories. 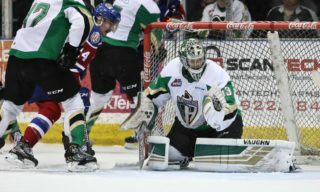 Scott presently ranks first among WHL goaltenders in victories and shutouts. He ranks second in GAA and SV%. The 19-year-old was named to Team WHL for the 2018 CIBC Canada Russia Series earlier this month and will play alongside teammates Brett Leason and Parker Kelly. 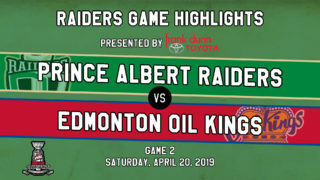 Before that, Scott and the Raiders will play once this coming weekend, playing host to the Kootenay ICE on Friday, November 2 (7:00 p.m. MT). 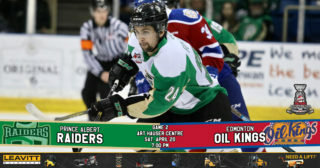 Get tickets for Friday’s game here.